Let these stressed out quotes encourage you. Find thoughts of people on how to cope when you are feeling stressed. "We are often so consumed with all of the stressful aspects of our life that we forget to take a moment to sit down, reevaluate our situation, and search for a sense of well-being, creativity, and… well, clarity." Amy Pendergrass, Productivity: Stick It! You have to discern which battles are worth fighting. 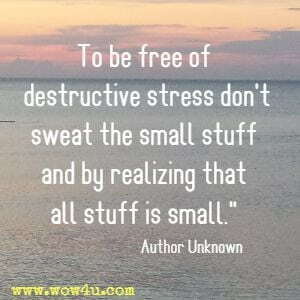 Think twice as not to stress yourself because of useless stuff. Ryan Cooper, Difficult People People Guide! Look for people who could help with difficult situations or who may just be able to talk things through with you. Baz O'Brien, Baz. Stressed Out!